PHOTO: Delta Air Lines' terminal at Atlanta's Hartsfield International Airport. According to the data, Delta flew the most passengers in the U.S. last year and Hartsfield boarded more passengers than any other airline. The 2013 numbers are in, and the traffic data for domestic and foreign airlines serving the United States showed a 1.3 percent increase over 2012, according to the U.S. Department of Transportation’s Bureau of Transportation Statistics (BTS). U.S. airlines and foreign airlines serving the United States carried 826 million passengers combined last year, the highest total since 2007. The systemwide total was the result of a 0.5 percent increase in the number of domestic passengers (645.6 million) and a 4.0 percent increase in international passengers (180.4 million). U.S. airlines carried 0.5 percent more domestic passengers and 3.3 percent more international passengers than in 2012, for a total increase of 0.9 percent. The number of passengers traveling to and from the United States on foreign carriers increased 4.9 percent from 2012. An upward trend of international passenger numbers continued throughout the year with increases each month in 2013 compared to the same month in 2012, but year-to-year declines in domestic passenger numbers resulted in decreases in total passenger numbers from the corresponding months of February, April and November of 2012 – the only months that were down. BTS also reported Delta Air Lines carried more total system passengers in 2013 than any other U.S. airline for the fourth consecutive year. United Airlines carried more international passengers to and from the United States in 2013 than any other U.S. or foreign carrier for the second consecutive year. 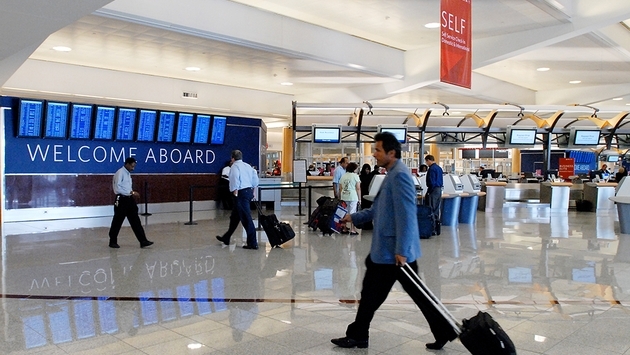 More total system passengers boarded planes in 2013 at Atlanta Hartsfield-Jackson International than at any other U.S. airport, and more international passengers boarded planes at New York’s John F. Kennedy International Airport than at any other U.S. airport.